I finished up this red and purple quilt and I love it! Which is really kind of weird, since neither red nor purple have ever topped my list for favorite colors. I used a variety of red and purple solids and monochromatic prints in the same colors for the improv blocks. Then I sashed those blocks in a dark gray solid. I sashed three of the blocks in a dark gray printed fabric (though the print reads a bit lighter than I was hoping for) for a bit of variety. Then these blocks were sashed with a nice light gray. I had two matching monochromatic gray prints, which I decided to mix in, and I do believe it’s one of my favorite parts. I think it adds some fun and interest to the sashing. I kept the back pretty simple, using the same light gray sashing color, along with a wide improv strip of the remaining red and purple scraps. I love me some straight line quilting, and I really love the quilting Kate did on this quilt (I may have mentioned this once or twice before!) so I decided to give it a try on this quilt. I marked the centerpoint of the quilt and then drew on lines 1″ apart for this fun chevron pattern. 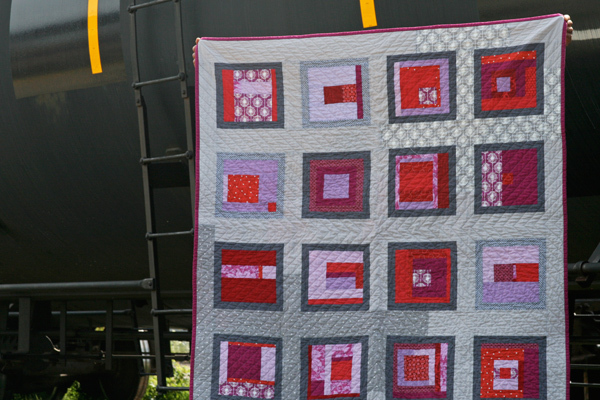 This entry was posted in [search] Square-in-Square Quilts, [search] Wonky/Improv Quilts, Finished Quilts, Posts about Quilts, Quilts and tagged baby girl, chevron, handmade, improv blocks, quilt, quilting, red and purple, straight line quilting. Bookmark the permalink. I love the gray with the red and purple!! This colour combination is gorgeous! Well done! Your quilt is beautiful! Great color combo! Yep, that sashing with the prints totally adds another layer of fab. Inspirational! Super nice! I like the colors. I love this quilt! Every time I see it, it makes me happy : ) I am not a huge fan of red or purple either but the combination with the grey is amazing. My favorite part might just the sashing though. Wow. If you change your mind, I want to buy it! Seriously! I love how you used the printed greys along with solid grey, it really adds depth to your already beautiful blocks. I think this is awesomely fabulous! Love, Love, Love it!!!! Absolutely beautiful! Awesome quilt! I love it! I also like the background of your pics. Unique! Wow, what a lovely quilt! Your right about the color combo. Red and purple sound odd together, but they look great in your quilt. I also love your quilting. What do you use to mark your lines? Do you draw all the lines on, or just the center then use a guide (to keep your spaces even) as you sew? First, let me say…I love your photos of Max! I don’t comment often, but I do read every single post. So. This quilt. Stunning! As is the backdrop…who would have thought to go by the trains??? LOVE IT! The grey print for the sashing really sets off the blocks – beautiful! I love the quilt!! An excellent use of color and pattern; very imaginative. But, I work for a railroad. Please, don’t post like this! Rail cars move very quietly, and you often don’t hear them. Plus, it is a bad example for others, especially children. Railroads are dangerous! not to worry, these cars were in a storage area. I obviously would not put anyone in danger while taking photos. You mentioned red and purple not topping your list of favorite colors and I felt the same until I was decorating my son’s bedroom. I know that sounds still more strange, but it turned out way cool with a shade of light pear green behind it. I’ve made the quilt top and backing to fit the space. Now I’m thinking of dabbling in red and purple again. Your current posts and previous post about this quilt have inspired me yet again! Thanks. My two favorite colors, though I wouldn’t have thought to put them together. It looks great! Beautiful quilt! I like the colors mixed they work great together. 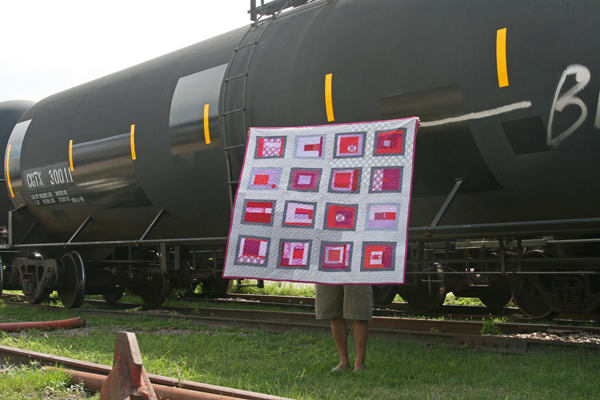 Do you quilt on a longarm or sewing machine? Love how this turned out! Such a cool color combination, and a great way to showcase those colors together. you are right, i love the color combo, though i never would have thought of it for myself! 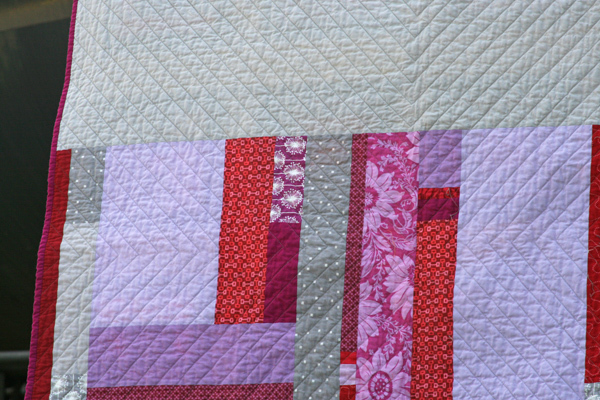 excellent work on the improv, and the quilting is a nice balance. What great colors! Are those Kona grays? Those colors are stunning together–nice work! Love, love the quilt — and whose cute legs are those poking out at the bottom? Please give credit to the model! I LOVE this quilt! 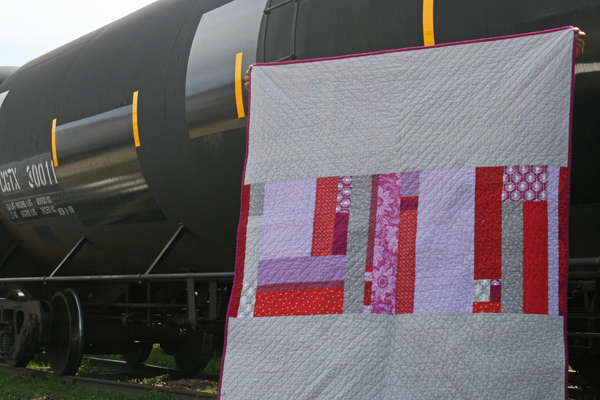 Red and purple are two of my favorite colors and I love the quilting. Just perfect. This is so pretty, I love the ideas you come up with! Now if I could just get some time to sit at my sewing machine! Thank you for your inspirations, just love them!